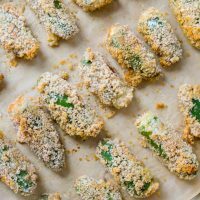 These roasted jalapeño poppers make an amazing appetizer. I made them last weekend to bring to a Canada Day party, where they were very popular! And just to show you how simple they are to throw together: I settled on making them the morning of, picked up a couple dozen freshly picked jalapeños from the farmers market on the morning dog walk, came home and quickly whipped up a batch of my homemade creamy vegan almond cheese, ate breakfast, watched a little TV, prepped all of the poppers, went to an open house in my neighborhood, came home and baked the jalapeño poppers, all before 2pm. And then of course had to chase my husband Omar away from eating all of them before we left for the party! While prepping these tasty morsels does take some time (sorry, it’s not instant), the good news is, you can remove the seeds and white pith, stuff them with cheese (which is quickly and easily done with a piping bag), and bread them in advance. Doing some or all of the prep work beforehand means that you have an easy and accessible party appetizer. Simply pop them in the oven just a bit before you want to serve them! The best part about roasting poppers instead of deep frying them, is that they’re actually quite good at room temperature. They maintain their crispy exterior, while roasting even brings out the best flavor of jalapeños! They also reheat really nicely in the oven. And if you happen to buy an extra bag’s worth of hot chiles at the farmers market you should probably try making my easy homemade hot sauce and then put it on everything for the rest of the summer, or for as long as it lasts 😉 . Let me know if you make these tasty poppers. I love seeing & hearing about it when you guys make my recipes! Leave a comment and/or rate the recipe below, tag me on Instagram (#thecuriouschickpea), or share with me on Facebook! If you only want to make a few poppers, the recipe is easily scaled down (or up, if that’s what you want). 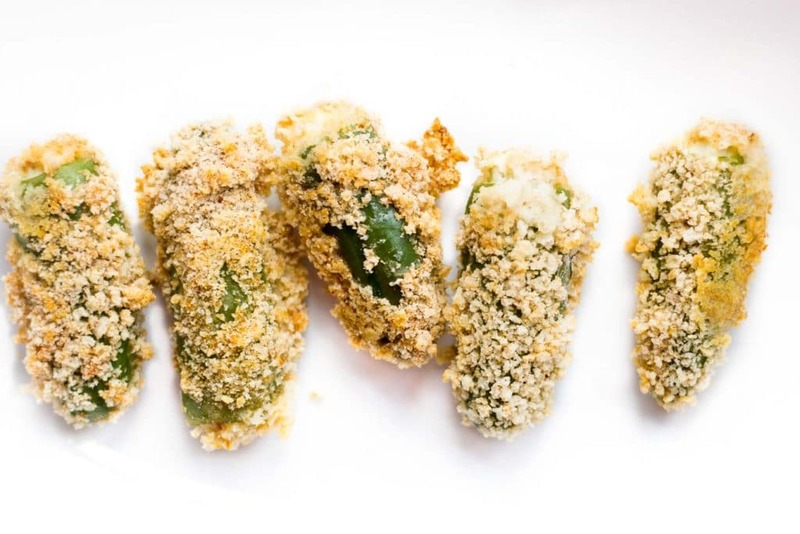 The jalapeños can be breaded in advance and refrigerated so that they may be baked just before serving. I successfully tested this and had them prepped a few hours before baking, but I would guess you could prep them the night before even. If removing the seeds and membrane is too challenging from the whole pepper, you can slice it in half and fill it as a boat and bread in the same way. If they are messier that way you can chill them a little before filling. You will end up with double the amount of poppers that way! Use food grade gloves to prep the jalapeños if you are concerned about getting jalapeño hand! 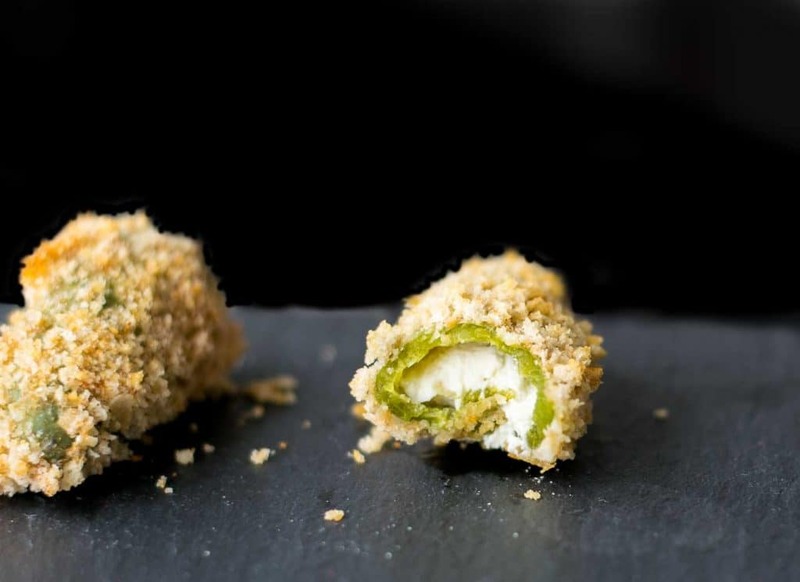 Spicy jalapeños are stuffed with creamy almond cheese, double breaded, and roasted for a healthy take on the classic treat. Preheat the oven to 425 ºF and prepare a large parchment-lined and oiled rimmed baking sheet. Prep the jalapeños: cut off the tops and cut around the white pith with a pairing knife. Then go in with a butter knife and scrape out as much of the seeds and membrane as you can. I found it easy to just stick the knife in (and don't use a sharp knife for this--you don't want any accidents! 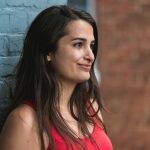 ), and twist it around, which breaks off the white membrane and loosens the seeds, which can then be tapped or shaken out of the pepper, leaving a hollow jalapeño behind. Fill a piping bag, or a ziplock bag, with almond cheese and snip off the end. Pipe the cheese into the peppers. Set up three bowls as your dipping stations. In the first bowl mix together the ground flax and water and let sit for around 10 minutes to thicken. Alternatively you can microwave it in 30 second intervals a couple of times to speed the process. In the second bowl mix together the flour mixture, and mix together the bread crumb mixture in the third bowl. To dip: Take each stuffed jalapeño and dip first into the flax egg, and then into the flour mixture. Put it back into the flax mixture, and then toss in the bread crumbs. Then set on the greased baking tray. Continue with the remaining jalapeños. *If your flax mixture starts to thicken too much, add a little more water. To make the process easier, have 2 forks to help you move the jalapeños between stations, a fork for the dry flour and bread crumb mixture and a second one for the sticky flax mixture. 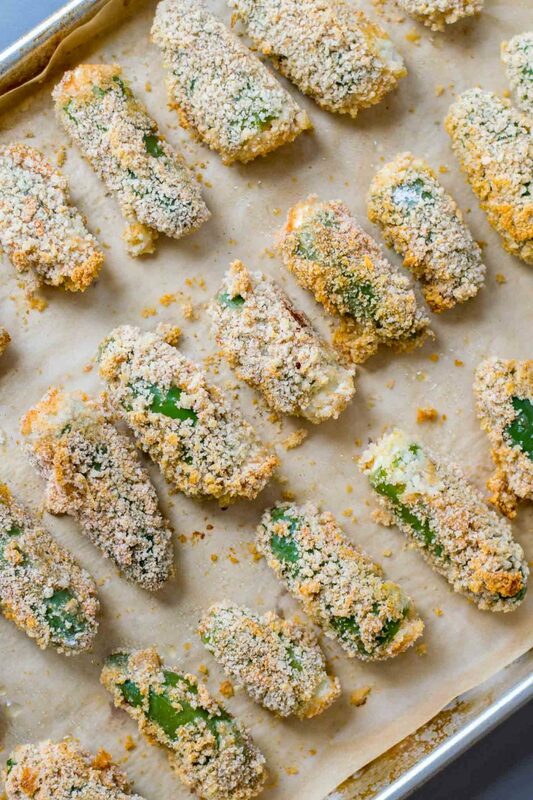 Once all the jalapeños are breaded, spray them with oil, or drizzle some on top. Then bake them at 425 ºF for 25-30 minutes, flipping them over in the last 5-10 minutes for more even browning. They are best served warm, but are also tasty at room temperature! Great recipe! Im going to try this!